Do you know what to do when you get a traffic ticket? Do you want to fight it but aren't sure exactly how to do that? Often times, a driver will feel like they weren't in the wrong. Sometimes they are, and sometimes they aren't, but if you really feel like you have been handed a ticket you don't deserve, you should know how to fight back. Make, model, color, and license of vehicle. The time, date, and setting of incident. The officer's badge number and name. Information on contesting in court. You should know that the format of a ticket and the accompanying information varies on a state by state basis. Upon getting your ticket, inspect it to see if there is any false information that you can use to build a defense in court. If you plead guilty to a traffic offense, you will need to pay the full amount of the fine, and you will receive points against your driver's license that will stay for three years. Pleading guilty can sometimes be the best option, but you may consult an attorney for a second opinion. Average moving violation fines vary from $75-$400, which may take a step up with repeat offenses plus a bad driving record. In the case of a speeding ticket, the amount of the fine is calculated based on how far above the speed limit you were traveling. Other reasons for higher fines are committing the offense in school or construction zones. Though the ticket will come with the amount due listed, if you feel like it may not be correct, you can call the court for confirmation. If you want the highest chance of success in defending against your violation, you've got to put together a strong case. It's best that you study the exact violation you were cited for, looking at any laws that have any bearing on it. If you plead ignorance, you can bet that you won't be getting out of your ticket. This is because the courts view driving as a privilege, and with that privilege, you are supposed to know what the laws are before getting behind the wheel. Simply stating, "I wasn't aware you had to come to a complete stop at a stop sign" isn't going to get your out of a rolling stop ticket. If possible, you should take pictures of the scene and try to gather witnesses to testify for you. When you make it to court, you should plead not guilty. This means you believe your violation can't be proven without a doubt. Very complicated traffic cases may call for the use of an attorney, but you can often defend yourself just by coming prepared. If you are not able to attend your court date because you are out-of-state or for some other reason, you can pay an attorney to fill in for you instead of having to come all the way back to the state that ticketed you. Situations in which it's always a good idea to consider a lawyer are cases involving a suspended license or criminal charges. In pre-trial, there will be something called "discovery." 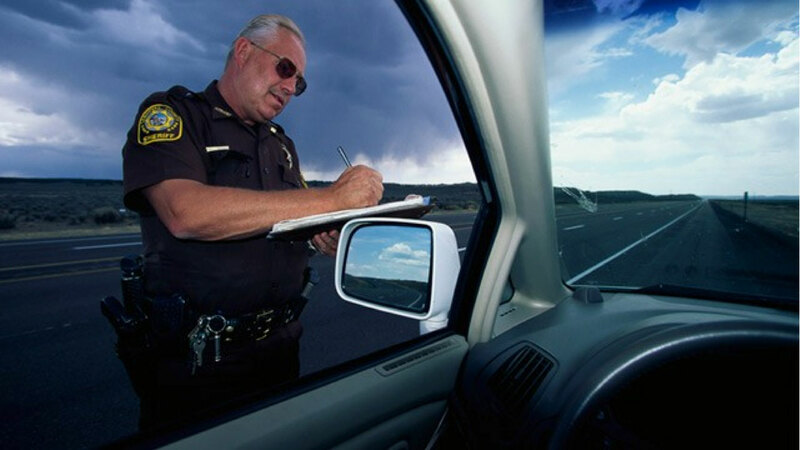 This is when you are allowed to check on the officer's notes that he or she took down when they ticketed you. You can bet that an officer will have noted the incident, making it beneficial for you to look over for any inconsistencies that can be used to build your case. Hopefully you followed the advice of cooperating so no incriminating statements are written in the notes. If you happened to get a citation for not having your driver's license, this can simply be remedied by showing your license in court. However, it must have been valid at the time of the incident. A subjective ticket, such as reckless driving, can be argued by questioning the officer's ability to see the incident clearly. You will have a chance to ask your ticketing officer questions in court, so jot down some questions that you think will help you cast doubt over the officer's determination. For casting doubt, a good method is to ask specific questions about the scene of the incident, since these details cannot be recalled without good notes. You should throw together an exhibit that demonstrates the incident as you saw it happen. Include pictures that clearly indicate the strong points of your defense. This exhibit will assist in building a "mistake of fact" defense. This type of defense means your violation can be dismissed because of the circumstances on the day of the incident. For example, you may have pictures of snow covering traffic signals, or you could show that a sign has been obstructed in some way. Swerving to miss a pedestrian or animal. Getting out of the way of a dangerous driver. Moreover, you may defend by insisting that your driving was legally allowed because of uncontrollable circumstances like a car malfunctioning. If something went wrong with your car and caused you to commit a violation, you'd have a good chance of getting charges dropped. Once again, you should get witness testimony if possible. If you fight the ticket successfully and are found not guilty, you can have your ticket dismissed and have any fines you've paid be refunded to you. However, if you are determined guilty, you will face the designated fines and appropriate points on your driving record. A misdemeanor or felony may also result in some jail time. Some circumstances will make it near impossible to fight your ticket. Traffic cameras are a prime example because you would have to somehow prove the camera wasn't working properly. You may not even know about the violation until you get a ticket in the mail, and by that time you won't even remember any details about the incident. It's up to you to decide if you can build a strong enough case to fight your ticket. You should be able to make a good determination by reviewing the facts of the incident and studying the laws associated with your violation. If you decide there's likely no chance of successfully defending against your ticket, you can always take a defensive driving course to have the fine and points associated with your ticket significantly reduced or eliminated. In addition to these benefits, you will learn safe driving techniques to help you in the future, and you prevent your insurance rates from going up.